Wood fire pizza ovens are amazing ways to cook high quality authentic pizza. The end result of doing so is always far better than anything you could make in a conventional oven you find in most home kitchens. It's tasty, it's fun, and gets you involved in cooking much more than just making frozen pizza! But, as amazing as they are, wood fire pizza ovens often aren’t practical. Not everyone has the space or money to build one, and not everyone wants to invest a lot of resources just for making pizza. That is where indoor pizza ovens for your own kitchen are incredibly relevant. After all, outdoor pizza ovens are typically bulky and can take a considerable amount of work to set up. In many cases, they are also expensive, often costing thousands of dollars, especially if you are buying a complete oven. That’s a lot of money and/or effort to get a working pizza oven. If this is viable for you, great. But, it won’t be the best answer for everybody. Besides that, a full pizza oven simply isn’t going to work in many environments. Winter time? Good luck making pizza in the snow! Also, if you’re renting or if you don’t have much outdoor living space – a bulky pizza oven probably isn’t for you. What about just making pizza in a conventional oven? Well, that could work, but not everyone has one of those. Small apartments sometimes only have a hot plate, or maybe your oven just isn't very good. Or maybe it's summer and you don't want to bake a pizza at 400º for 30 minutes while it's 100º outside. So, why not go for an indoor, stand-alone pizza oven? They tend to be much smaller and more practical. For example, you can often set them on your counter top and use them like any other kitchen appliance. This means that you can still get amazing pizza in the comfort of your own home, regardless of any space limitations. So then, what are some of the options and how do they compare? 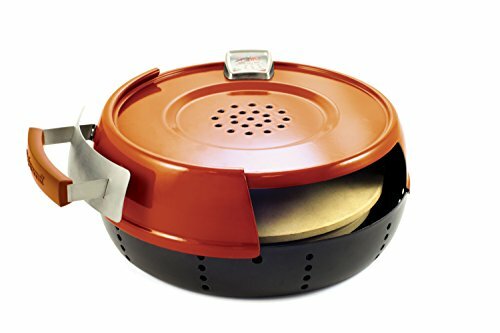 This pizza oven is a fairly common style for an indoor pizza oven and is mostly just a variation on a traditional toaster oven. For that matter, the full title of the product also calls it a snack maker and a toaster oven. This approach is both good and bad. On the plus side, it gives you a versatile tool for the kitchen, one that fills several roles. There are also specific settings for cooking, which include the ability to choose the type of pizza crust that you are working with. The viewing window also makes it easy to keep an eye on your cooking throughout the process. But, as you can probably guess, the style has limitations for making pizza. For one thing, there is no pizza stone, just a ceramic-coated tray. Visually, this pizza oven isn’t particularly exciting, but it does look professional. And, if you’re after authentic results, who cares what the appliance looks like. Instead, the style here is more commercial in nature and would also work very well with a pizza peel. Information from customers does also show that you end up with pizzas that taste great. The oven does underperform compared to a traditional pizza oven because the default settings are 450°F for 10 minutes. That’s much lower than you should be using to get the authentic taste and texture of a Neapolitan pizza. This pattern is common among the various indoor pizza ovens and you’ll find that most cannot get to the temperatures that outdoor alternatives can reach. Even with that limitation, it’s easy to see how this pizza oven would work for some people. It's a great option for someone without a conventional oven that wants a cooker big enough to make some pizza pies. 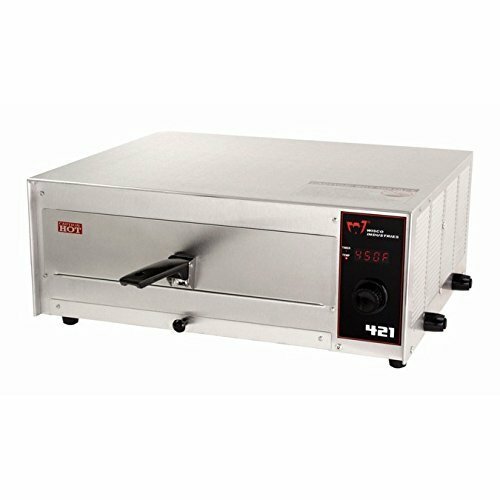 If nothing else, the product is an efficient oven that cooks pizzas fairly quickly, along with a range of other products. The same company does also offer other similar products, which tend to differ slightly from one another in design. 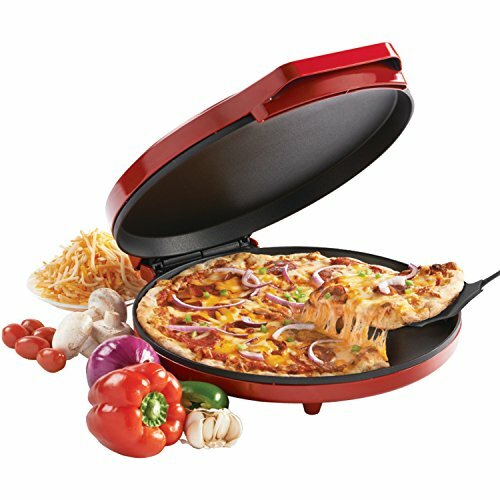 This product is touted as a pizza maker, although the company does also suggest that you can cook a range of things in it. The overall style works well for trapping in the heat, helping to ensure that your pizzas cook well, cooks evenly, and cooks quickly too! But, there are limitations too. The most significant one is that the pizza oven only goes up to 400°F, which is on the low side for cooking pizza. Additionally, there is no way to adjust the temperature. The lack of adjustment means that you have little control over your pizza and no way to ensure perfect outcomes. Likewise, you’re not going to get authentic homemade pizza at just 400°F. Still, it's small size makes it easy for storage, and it's got an nice look to it as well. Another downside is that all your pizzas will turn out the same size, and you can only make one at a time. Hamilton Beach is another brand that has tried to cash in on the pizza making craze. The product here is almost identical to what Better Crocker had to offer and, as such, has the same overall advantages and disadvantages. Generally speaking, either option would work well enough if you wanted to quickly cook pizza (or other foods). The products can also be fun to use and fairly easy to clean. So, in that sense, they are appealing. In comparison to the Betty Crocker product shown above, this one seems to have more room on top for the crust to expand. Pizzacraft is a popular brand for pizza ovens, including indoor and outdoor options. But, this particular pizza oven is certainly unusual. As the name suggests, the tiny ‘oven’ is designed to be used on a stovetop, meaning that your gas stove burners acts as the heat source. One catch is that it only works for gas ovens and even then some styles are excluded. Make sure you're running 9500-15000 BTU NG or LPG! But the thing I love about this option is that it's more of an authentic pizza-making experience than the other options on this list. This would be my first choice to go with, despite lukewarm opinions from some reviewers. You get to use a pizza peel, and make your pizza on a real pizza stone! You can't replicate the smokiness of a wood-fired oven, but it's still pretty close. It reaches a full 600°F which, although it's not the 800º of a legit oven, is still pretty good for indoor cooking on a gas stove. This is higher than a conventional oven and most other options on this list. If you really want to step up your pizza game, you need to get outdoors though. You can actually convert your gas barbecue with homemade barbecue conversion hacks. Just considering indoor cooking, this would be my #1 choice to go with if you have a gas oven with burners. I'm actually very surprised at how well this device works, and how well it's received by people online. It looks like couldn't cook much, and is nothing more than a warming plate. 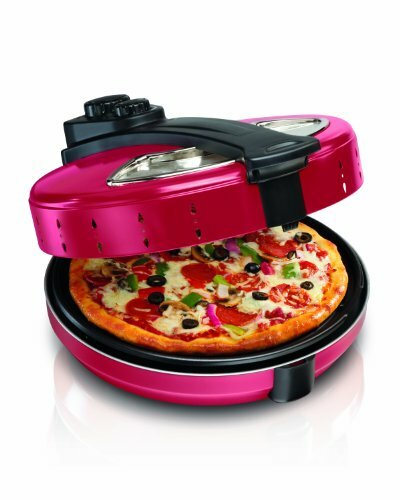 But from the pictures I've seen, it works great for pizzas. 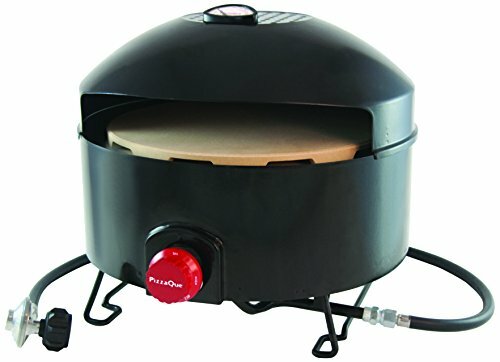 The Presto Pizzaza is a ‘pizza oven’ that uses an unusual style. It looks like a clothes iron hovering over a spinning plate. Basically, the style here makes it easy to bake a large range of different foods, including pizza. You also get the chance to closely watch your pizza as it cooks, giving your more control than most other products. 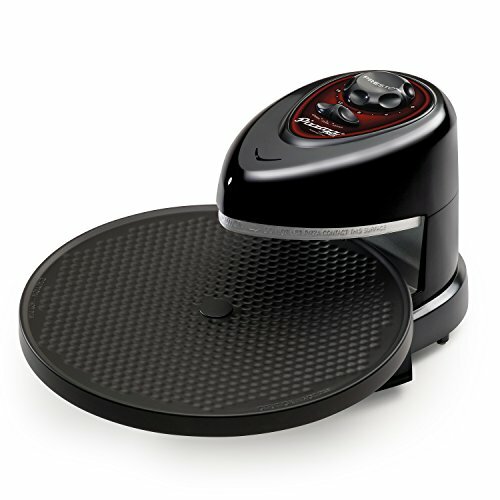 The base does also rotate, giving you an even cook overall. For regular cooking, I can see the appeal of this oven. But for pizzas, not so much. Realistically, the machine isn’t going to get anywhere near as hot as a pizza oven. The temperature also isn’t as concentrated, so your pizza would turn out differently. 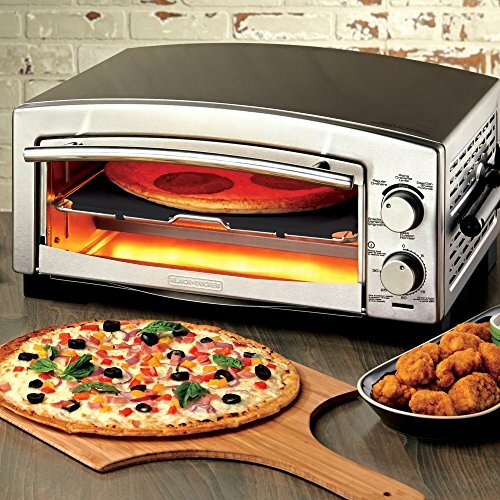 I've really got to try this one out to see if it can cook raw dough well versus just heating up frozen pizza, and just how crispy the crust gets. Full review coming soon! One big advantage of this product is the multi-purpose uses! Some commenters have said to throw away your microwave. It's also quite inexpensive compared to some other choices on this page, so it makes it easier to buy and try out. As you may have noticed, most of the indoor pizza options are fairly limited. They simply don’t reach a high temperature and they tend to be designed for pizzas plus other types of food. For that matter, some of the products don’t even have pizza stones. That pattern may be fine in many situations, especially if you like having multi-functional devices. But, it isn’t so great if you specifically want authentic pizza. That’s where this pizza oven comes in. True, the model is an outdoor pizza oven and runs off propane, which isn’t the best idea for a kitchen. But, it is also portable and this means that you could theoretically use it inside. I think this would be a great option for a balcony of an apartment! It's technically “outdoors”, but when you say that people tend to think of a backyard or park. The balcony of an apartment is kind of like a mix of indoors and outdoors if you get what I'm saying. I probably wouldn't want to run a full wood-fired oven like the Weber Kettle grill conversion kit because it gets super hot and can actually spew out flames if you put too much wood. That spells danger! The oven goes up to 700°F, which is the temperature you need to cook high-quality Neapolitan style pizzas. Most of the other items on this list don’t even get close to that temperature. Within this list, there are a few different styles of indoor pizza ovens. But, for the most part, they are all just conventional ovens with some tweaks. Some of them go to a higher heat than others but they won’t actually offer an authentic pizza-making experience and the final product is compromised as well. In many cases, this outcome is completely fine. After all, you can still use homemade pizza dough recipes in this type of product and you have considerable flexibility in what you create. Still, if you’re wanting a more authentic experience, you may need to branch away from indoor pizza ovens. Portable outdoor options [LINK], are one way of doing so. Alternatively, you can just take the experience outdoors entirely. 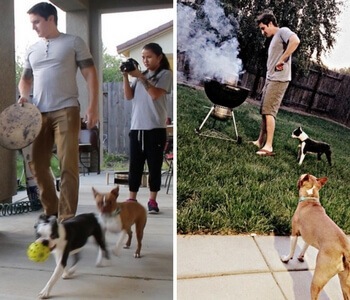 Doing so is lots of fun and you can even take advantage of your own grill to cook pizzas. 21 Gluten Free Dishes Even Normies Will Enjoy! 20 Gluten-Free Key Lime Pie Recipes…Yummy! 10 Sous Vide Ham Recipes For Breakfast, Lunch, Or Dinner!